1857 — National Association of Baseball Players founded, New York. 1927 — The world’s first live radio commentary of a soccer match is broadcast. 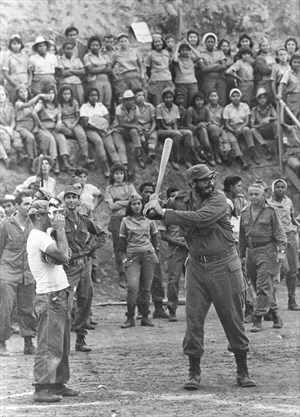 1951 — Fidel Castro is ejected from a winter league game after beaning batter. 1956 — Canadian Football Council forms. 1960 — Paul Pender beats Sugar Ray Robinson for middleweight boxing title. 1968 — NBA announces it will expand to Milwaukee and Phoenix. 1969 — Roy Campanella and Stan Musial elected to Baseball Hall of Fame. 1973 — George Foreman TKOs Joe Frazier in two rounds for heavyweight boxing title. 1980 — PGA begins a senior golf tour. 1980 — West Indies beat England 2-0 to win first World Series Cup. 1981 — O.A. (Bum) Phillips becomes head coach of the New Orleans Saints. 1982 — Free agent Reggie Jackson signs a four-year, nearly US$4-million contract with the California Angels. 1983 — Björn Borg retires from tennis after winning five consecutive Wimbledon championships. 1984 — Annette Kennedy of SUNY sets women’s basketball record with 70 points. 1984 — NFL Super Bowl XVIII: Los Angeles Raiders beat Washington Redskins 38-9 in Tampa, Fla; MVP: Marcus Allen, running back. 1987 — Blizzard in New Jersey, as 334 attend the New Jersey Devils vs. Calgary Flames NHL game. New Jersey wins 7-5. 1988 — Mike Tyson TKOs Larry Holmes in four rounds for heavyweight boxing title. 1989 — Super Bowl XXIII: San Francisco 49ers beat Cincinnati Bengals, 20-16 in Miami; MVP: Jerry Rice, San Francisco, wide receiver. 1990 — Will Clark, National League’s Most Valuable Player signs a $15-million, four-year contract with San Francisco Giants. 1993 — Johan Koss skates world record 5 km in 6:38.77. 1998 — NHL’s Minnesota franchise selects the nickname Wild. 1998 — Rickey Henderson rejoins Oakland Athletics for fourth time. 2003 — Catcher Ivan Rodriguez signs a one-year deal worth $10 million to play with the Florida Marlins.